Call 828-414-8782 to schedule your first appointment. If you're interested in learning about hearing aids in Asheville, NC, Miracle-Ear® is here for you. We can give you an overview of the different products we offer, and our experienced hearing care specialists will help you find the best match for your needs. Our hearing aids with GENIUS™ Technology have been designed with our customers in mind. These hearing solutions incorporate technology that will allow you to improve your ability to block out wind noise, focus on the sounds that are important to you, and have both of your hearing aids working in conjunction with each other to give you a better listening experience. Fitting you with hearing aids is just the start of our relationship with you. We provide ongoing care to all of our customers, and you can count on our support whenever you need it. Come into our Miracle-Ear hearing aid center in Asheville to see why we're America’s most recognized brand of hearing aids. We'll sit down with you to discuss the different styles of hearing aids that we offer, and we can have an in-depth discussion with you about how to maximize your ability to engage with others in a variety of listening environments. Our center proudly provides free hearing tests* and free hearing aid repairs, and we invite you to discover and experience the Miracle-Ear advantage. 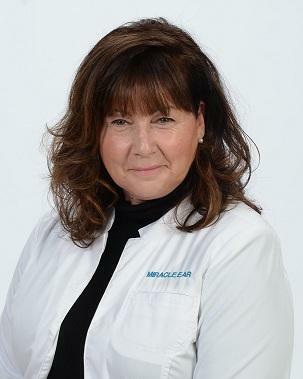 Marian began her career as a Hearing Healthcare Professional in 2001. She is proud to be affiliated with Miracle-Ear because of their impressive customer care and the advanced technology that is offered. She is a member of the International Hearing Society. Marian has been awarded by Miracle-Ear the "President's", "Patient Satisfaction" and "Market Development" Awards for multiple years. It is her great pleasure to be of service to those in her community who are having difficulty hearing their families. 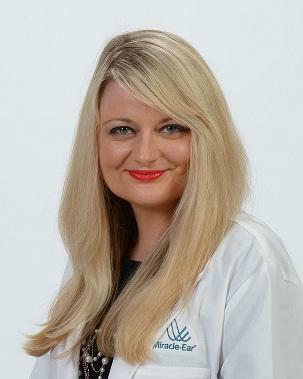 She says, "There is such a rewarding feeling when you see patients' faces light up for the first time they hear again. I love reaching out, shaking their hand and saying, "Welcome back," because that is truly how it feels - you are back!" Marian is the proud mother of two sons and two daughters, and now she has five grandchildren who fill her life with joy. She spends her spare time gardening, walking, reading and doing yoga. Marian looks forward to many more years of wonderful service with Miracle-Ear and the Western North Carolina community. Tessa is a native of Western North Carolina and has always appreciated the beauty of the Blue Ridge Mountains. She explains, "There is no place quite like it. The people make the difference, and this part of North Carolina is such an oasis that it is no wonder why so many people migrate here." Tessa attended the University of North Carolina at Greensboro and majored in Theater Arts. She is very excited about her new budding career with Miracle-Ear. She says, "I love that we take such an initiative for our patients' needs, and we take care of each person to better enhance their lives through the gift of hearing." Mrs. Schneider, It would be remiss of me if I didn’t try to thank you for all your wonderful and professional service afforded to me for all these many months. You and your assistant always greet with a smile and show you are truly interested in their welfare. Your follow-up service is also much appreciated. No doubt Miracle-Ear is the finest service anywhere. Please accept my thanks – I am truly grateful. A belated note of gratitude for your Miracle Ear location on Hendersonville Road in Asheville, NC. For more than 10 years, your specialist Marian, has always been there for me whenever I have needed directions, corrections or an excellent technician. She has always been knowledgeable, patient, cheerful and able to find the best solution to my problems. This past fall, I had a problem where her abilities really stood out. Unknowingly, I had dropped one of my aids into the toilet, where it remained for over an hour. I fished it out and placed it into a Ziploc bag and covered it with uncooked rice. Having little expectation for a happy outcome, I delivered my damaged product to Tessa, the patient care coordinator. This time I must wait until Marian was scheduled to be in. The wait was well worth it when I received a call in a few days explaining that Marian had examined, fixed and cleaned my aid and that it was working fine. I feel fortunate to have a team like Marian and Tessa taking care of my hearing needs!